Keys Concepts are tools used to understand, to analise and to implement industrial Disaster Risk Management. They are relevant for better preparedness and response to any industrial disaster situation. Any unplanned, sudden event which causes or is liable to cause injury to people or damage to building, plant, material or the environment. A systematic, independent and documented process for obtaining evidence and evaluating it objectively to determine the extent to which defined criteria are fulfilled. This does not necessarily mean an independent external audit (an auditor or auditors from outside the organization). Result of a specific event. A person or an organization providing services to an employer at the employer's worksite in accordance with agreed specifications, terms and conditions. A formal written plan which, on the basis of identified potential accidents together with their consequences, describe how such accidents and their consequences should be handled either on-site or off-site. Any physical or legal person that employs one or more workers. Evacuate means to move all people from a threatened area to a safer place. To perform an evacuation, there must be enough time for people to be warned, to get ready, and to leave an area. Generally, if there is enough time for evacuation, it Is likely to be the best protective action. An inherent property of a substance, agent, source of energy or situation having the potential of causing undesirable consequences. 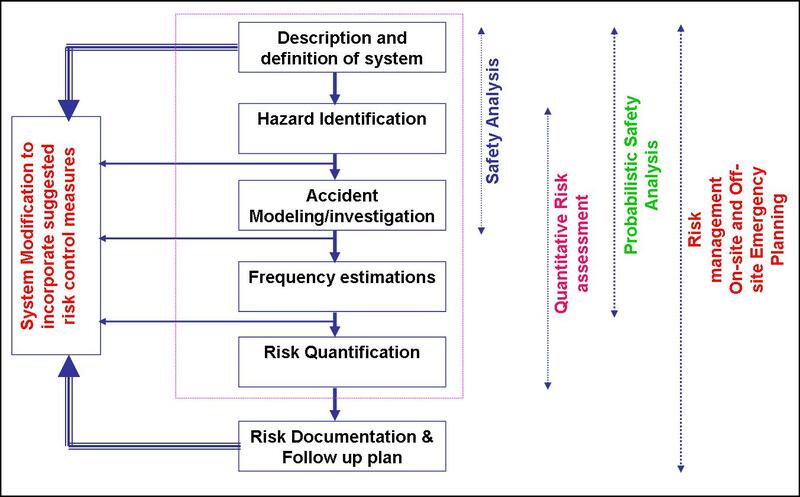 A systematic evaluation of hazards. An element, compound, mixture or preparation which, by virtue of chemical, physical or (eco) toxicological properties constitutes a hazard. Accidents and/or near misses. Unsafe occurrence arising out of or in the course of work where no personal injury is caused. In-place protection means to direct people to quickly go inside a building and remain inside until the danger passes. When protecting people inside, direct them to close all doors and windows and to shut off all ventilating, heating and cooling systems. In-place protection is used when evacuating the public would cause greater risk than directing them to stay where they are, or when an evacuation cannot be performed. When inside people must keep all windows and doors closed. In-place protection may not be the best option if the vapours are explosive, if it will take a long time for the gas to clear the area, or if the buildings cannot be tightly closed. Isolate Hazard Area and Deny Entry means to keep everybody away from the area if they are not directly involved in emergency response operations. Unprotected emergency responders should not be allowed within the isolation area. This 'Isolation" task is done first to get control of a place to work. This is the first step for any protective action that follows. Any unplanned, sudden event which causes or is liable to cause serious injury to people or damage to buildings, plant, material or the environment. A company, operation, firm, undertaking, establishment, enterprise, institution or association, or part of it, whether incorporated or not, public or private, that has its own functions and administration. For organizations with more than one operating unit, a single operating unit may be defined as an organization. The likelihood that a considered occurrence will take, place. A combination of the likelihood of an occurrence of a hazardous event and the severity of injury or damage to the health of people caused by this event. The value judgment of the significance of the risk, identified by a risk analysis taking into account any relevant criteria. 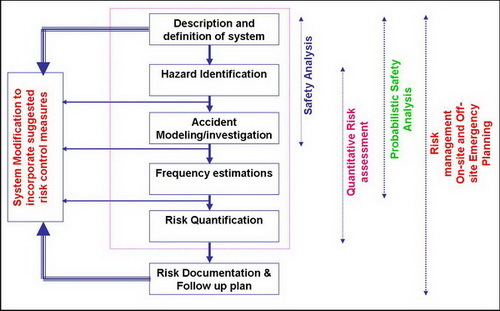 The process of evaluating the risks to safety and health arising from hazards at work. Actions taken to achieve or improve the safety of the installation and its operation. This means movement of hazardous substances from one place to another or air, rail, road or water. A person or an organisation engaged in the off-site transportation of a hazardous substances by air, rail, road or water. Any person who performs work, either regularly or temporarily, for an employer. Physical area where workers need to be or to go due to their work which is under the control of an employer. The Bhopal Gas tragedy of 1984, the worst chemical disaster in history clearly demonstrated the potential of industrial disasters to cause immediate and long-term damage. We know something is likely to happen but not what will happen where. The need is to build a culture of zero tolerance, to be prepared to anticipate and deal with risk at all times and in all situations, rather than responding to disaster only after it has struck. The rapid growth of chemical industries in India has led to increased risk of incidents associated with hazardous chemicals (HAZCHEM). The scale of risk is large and widespread. There are more than 1700 major accident hazard (MAH) industries and thousands of small and medium enterprises spread all over the country using hazardous chemicals which may cause major accidents. Industrial disasters can be caused by chemical, mechanical, civil, electrical or other process failures, or due to accident, negligence or incompetence of human operators. Chemical disasters can result from fire, explosion, toxic release, poisoning or a combination of all these. Such disasters can occur in manufacturing installations, isolated storage warehouses, ports, docks and fuel depots; or while hazardous chemicals are being transported by road, rail, air, water or by pipelines. Disasters in an industrial plant may spill over to areas outside the plant causing damage to life and property. This is what we can prevent by industrial disaster risk management, using quality audits and quantitative risk assessment tools which help to identify worse case scenario impacts and mitigation measures so that we can minimize damage due to chemical accidents. Do you have any request?